Unfortunately, I couldn't make it to the Zack Greinke press conference this afternoon, but I did have a chance to watch it online. My initial impression of Zack is exactly what I expected. Knowing that he has had social anxiety issues in the past, I figured he would look a bit uncomfortable up on stage. He definitely looked nervous and stammered/mumbled a bit when he spoke. You can tell he knows what he's talking about, though, but seems to have a difficult time verbalizing it to the large crowd. I would suspect he was well spoken when he met with the Dodgers brass on a more individual level. Magic spoke about the sting they felt last season by not making the playoffs. They didn't like the feeling of losing. Starting pitching then became their most important focus. They knew Zack would be a free agent and immediately identified him as their #1 target. They liked Zack's commitment to his craft and his professionalism. 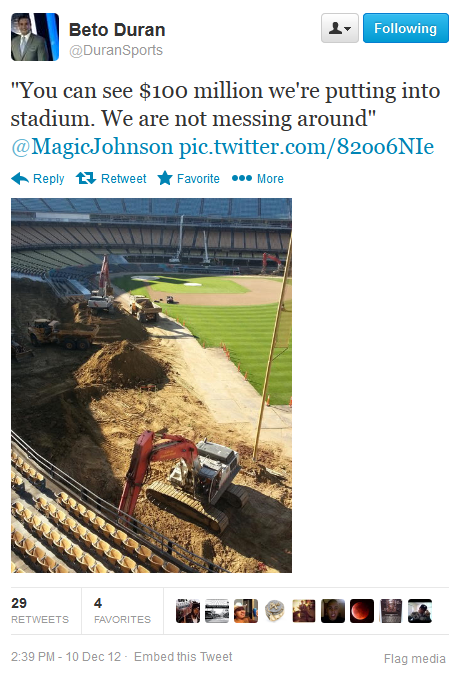 Magic exclaims that, "Dodgers pride is on the way back." Then, Ned Colletti spoke briefly before introducing Greinke. BTW, Zack will wear #21. Ned said that they set out to find the best pitcher they could find- someone who could sit alongside of Clayton Kershaw. Here are the notes from Zack Greinke's question and answer session. A determining factor for picking a team was joining a club that would compete year after year, and finding a place he and his wife would enjoy living in. He prefers to pitch in a park that allows him to be a fly-ball pitcher - said his style is geared towards giving up fly-balls. He thought Stan Kasten was the smartest guy he has ever spoken to, and was therefore a large factor is him signing with the Dodgers. Mike Scioscia had mentioned that Zack Greinke loves to hit, but Zack emphasized that focusing on hitting can often hurt his ability to pitch. So, he doesn't spend much time focusing on it today. He spoke of writing down the lineups of every team chasing him and suddenly realized how strong the Dodgers team is. First thing he told Ned was how much he liked our 1st Round draft pick last year (Corey Seager). When he was asked about his comfort level he said large press conferences doesn't bother him, but one-on-one's do bother him since he always gets the same question. He also added that each time he answers those questions the answers get worse each time. In meeting with the Dodgers, they went through the Dodger lineup talking about how he would get them out. Zack said Don Mattingly seemed kind of laid-back. Appreciates that Don strives to be better. Said every batter has a hole, but the Dodgers have a couple of players that have no holes in their swing. He refused to name the two Dodgers. In the middle, a question was asked of Magic Johnson about the team philosophy this winter. All he would say was, "We Want to Win!" Ned Colletti was also asked a question, so he went ahead and described the interview process they had with Zack. He was impressed that Zack came to Dodger Stadium without an entourage. They spent 3 hours chatting and talking Baseball. Ned felt that allowing Zack to come out alone was a stroke of genius since they had an opportunity to really get to know the kid instead of the dynamics that surround him. Later on, Zack Greinke spoke with Steve Lyons and Patrick O'Neal. Zack is a huge basketball fan, and enjoyed speaking with Magic about the game. BTW, he's an Orlando Magic fan. He noted that AJ Ellis is a good hitter, and the Dodgers have no easy outs. Said Matt Kemp use to be easier to get out, but is a lot harder now. It's clear he is very analytical when it comes to pitching. Mark McGwire was a favorite of his growing up and thought his signing as the Dodgers batting coach was a great call. Then, our resident genius - Stan Kasten - spoke with Lyons and O'Neal. Stan said that Zack was "beyond impressive" in their interview, and that he may remember every pitch he's ever thrown. 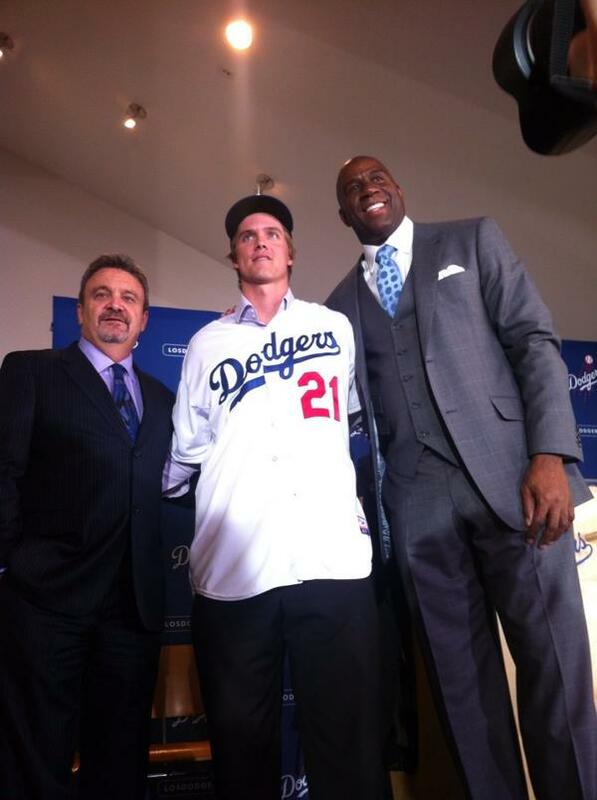 So, I guess that means there's a bit of a brilliant genius in Greinke. With that, the presentation was done. 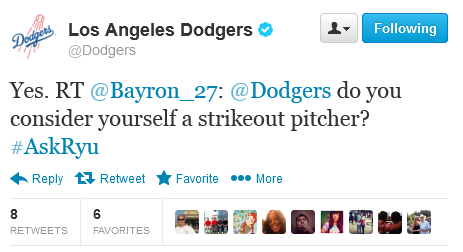 Zack continued to speak with other reporters in the room and even did a "Ask Me Anything" on twitter for the Dodgers. I haven't checked that out yet, but I'll be sure to note some of the dumb questions he received. 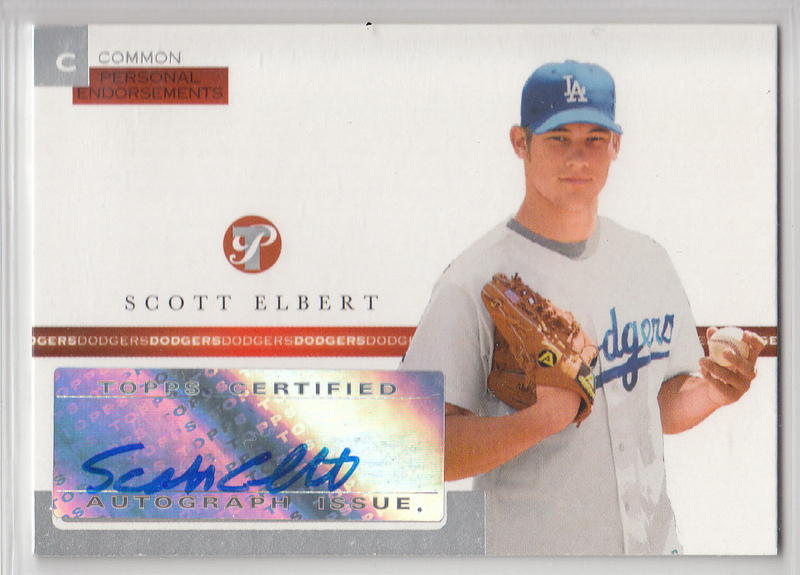 Scott has been very effective as a left-handed arm out of the 'pen. He's had two straight season of an ERA under 2.50, and strikes out almost a batter an inning. Unfortunately, he went down late last season due to elbow problems, and had to go under the knife for a cleanup in early September. According to recent reports, Elbert should be on track to be ready to pitch at the start of Spring Training next year. Will he be ready to be our primary lefty arm? Only time will tell. At the moment, the Dodgers lack some depth when it comes to left-handers in the bullpen. The only other option we have right now is recent draftee Paco Rodriquez, so it figures that the Dodgers might still be looking for another arm to fill that potential hole. On the other hand, Paco looked good in the 11 games he pitched last season, so maybe we have a solution right in our own backyard. 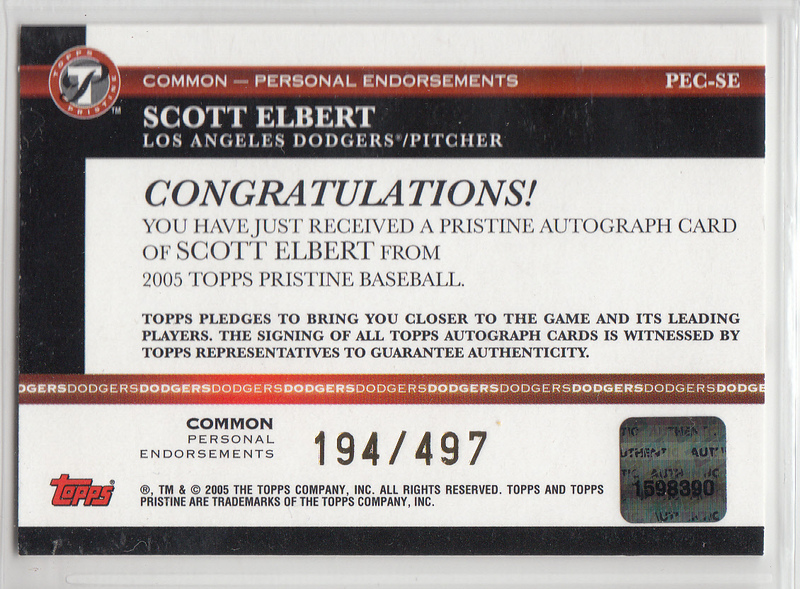 Featured here is a 2005 Topps Pristine autographed card of Scott Elbert in my collection. What a busy week this has become for the Dodger fan. 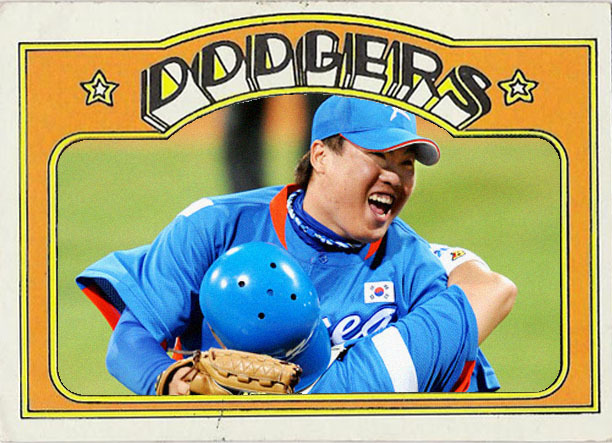 Yesterday, we were introduced to Hyun-Jin Ryu. Today, it's Zack Greinke's turn to formally meet the fans- well, at least the local media. At 1:30 PM, the Dodgers will show off their newest starting pitcher, and you can watch it all on Prime Ticket. You may also watch it live online on FoxSports West or here. 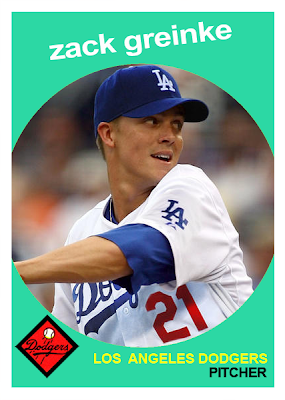 In honor of the todays showcase event I decided to use the photo tweeted by the Dodgers yesterday to make the above 1959 Topps fantasy card of Greinke. I think I've got everything spelled right this time. I have no idea if he'll be able to sign autographs or take photos with fans. BTW, Eric Stephen at True Blue LA has an excellent list of links related to his press conference yesterday. See it here. "He's ready to rock and roll. Obviously there's going to be some transition in a little bit of that both culturally, probably less baseball wise than culturally." He added, "He's about 6'2, about 220, strong, great fast baseball change, breaking ball. Think about having to ability acquire somebody like that at 25 years old and putting him in your rotation [...] His pitched competitively in the WBC, its been great, pitched in the Olympics, been great, well as not Major League Baseball it's probably the best standards as you can have outside of Major League Baseball." Sometimes social media isn't a good thing. As a prime example, check out some of the questions asked of Ryu during the Dodgers brief "Ask Me Anything" session on twitter yesterday. Fans asked a question using the #AskRyu hashtag and Ryu would respond to some of them. At first glance, it seemed like a great idea. 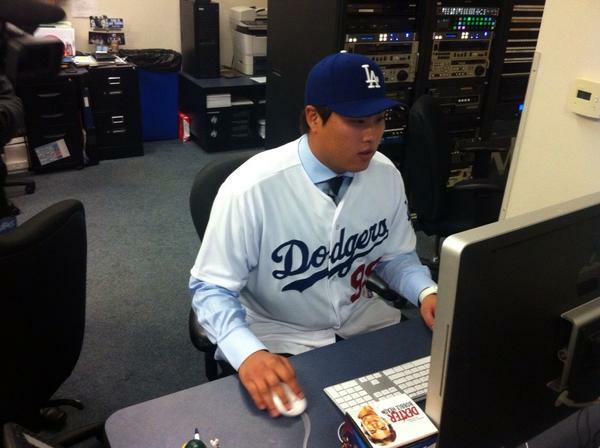 Have Ryu spend a little bit of time with the fans while not putting too pressure on him on his first day on the job. Heck, it started out as a fun way to meet and greet a new face, but instead soon devolved into a "twitter-mess". Check out what I mean below. First, Ryu answered a question with the directness of a confident pitcher. Soon, the questions came in fast and furious. Twitter was a flutter. Fans from coast to coast, and from sea to sea jumped in. And of course, the jokers came in to pounce. Yeah, I get it. Tommy is fat, Magic is starting to get a little round, and Ryu is a portly man. OK. I get it. ESPN Reporter Beto Duran tweeted this pic from Dodger Stadium yesterday. As you can see, they have removed much of the concrete from the field level seats and are in the process of digging out a new clubhouse for the players. Furthermore, Duran notes that this is a $100Million makeover. If you don't already know the details, Eric Stephen at True Blue LA has a complete breakdown of Hyun-Jin Ryu's contract. Dodger Pulse has a bunch of photos from the recent Dodgers Mall Tour in West Covina that was held this past Saturday. Go here to see them. 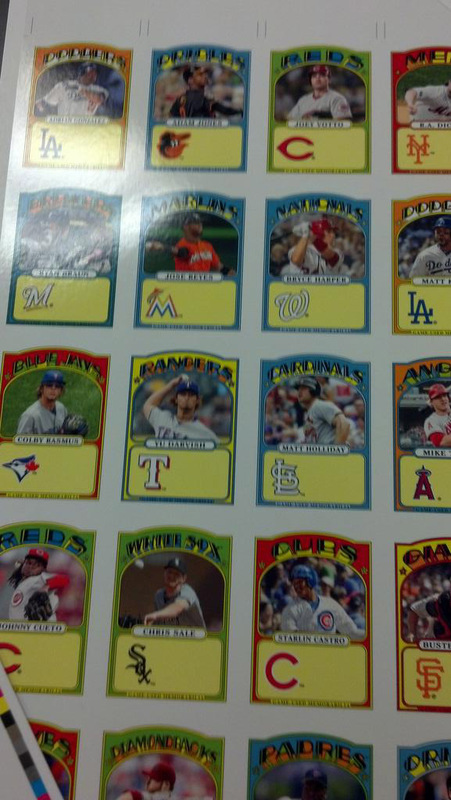 Topps tweeted a preview pic from an upcoming 2013 Baseball product (Retro Mini's) that uses a 1972 Topps vintage design for an autographed card. See it at right. If you look closely you'll see a Matt Kemp card along the right border. Click on the pic to embiggen. BTW, go here to see the Kemp Retro Mini base card. Additionally, in Greinke’s exposure to the National League with the Brewers, he was caught by some exceptional pitch-framers, and the numbers suggest that Greinke derived a considerable benefit. The purest evaluation of a pitcher isolates him from all other variables, and catchers are among them. We don’t know nearly enough about this to say that Jonathan Lucroy and Martin Maldonado helped Greinke by X runs, but there might be something there. A.J. Ellis‘ framing numbers, by comparison, are not good. It’ll be better for Greinke to pitch in the NL Los Angeles instead of the AL Los Angeles, as it was better for him to pitch in Milwaukee, but the catchers are going to be different. Here's some tabloid kind of stuff. TMZ has a pic of Josh Beckett being paddled around by his "hot" wife. Via Net Income at NetDaily, they mention that Monday was the dedication of an Ebbets Field flagpole at the new Barclay Center. Dale Murphy's only daughter makes an impassioned plea in support of her fathers induction into the Hall of Fame at The Hall of Very Good. COED blog has the ultimate guide to what I like to call the "Year of Kate Upton". Check it out. Ball Caps Blog notes that the Baseball Solstice falls on Christmas this year.